Zlatan Ibrahimovic - professional football's most mercurial player, Swedish national hero, tabloid fixture, fashion icon, modern day-philosopher and black belt in Taekwondo. 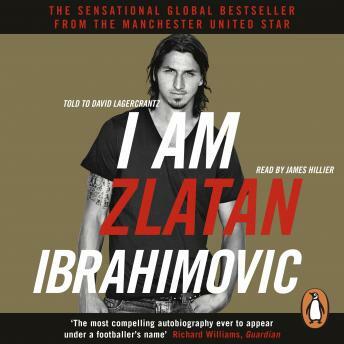 Born to a Muslim father from Bosnia, and a Catholic mother from Croatia, Zlatan recounts his extraordinary life story, from his poverty-stricken upbringing as an immigrant in Malmö, Sweden, to becoming one of the world's most sought-after and expensive players, gracing Europe's finest clubs, from Ajax to Juventus, Internazionale to Barcelona, Milan to Paris Saint-Germain, and now Manchester United.. I AM ZLATAN reveals a rare and ferocious intelligence, willpower and God-given talent most recently exhibited when Zlatan scored all 4 goals for Sweden in a 4-2 victory against England. His fourth goal, a 30-yard overhead kick with his back to goal is widely regarded as one of the greatest goals of all time. The BBC described it as a goal that 'combined unfathomable imagination and expert technique'. Love it, he was my favorite player, even before listening to this book. He has had it tough but still pushed it and made it.